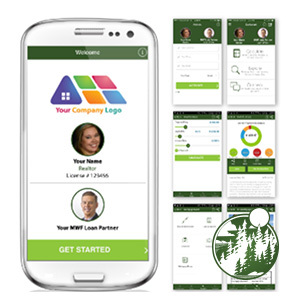 With our MWF mobile app, you can provide your clients with an easier, more accurate way to calculate their monthly mortgage payments. Mountain West Financial will do the work for you, providing your clients with a suite of robust mortgage calculators, educational and interactive mortgage guides, loan status updates, and instant access to your loan officer. Help your clients explore the home buying process with the step-by-step guide or determine which program is right for them with LoanGenie. Receive professional advice and updates on the go with direct messaging and push notifications. Best of all, it will be cobranded with your contact information and is easily shareable to your clients via your own unique website link! Ask me for more information today!